It's impossible to determine who's the best. They are all approximately equally good. And most of them train together too. At least I know SAS, FSK and GSG-9 do. 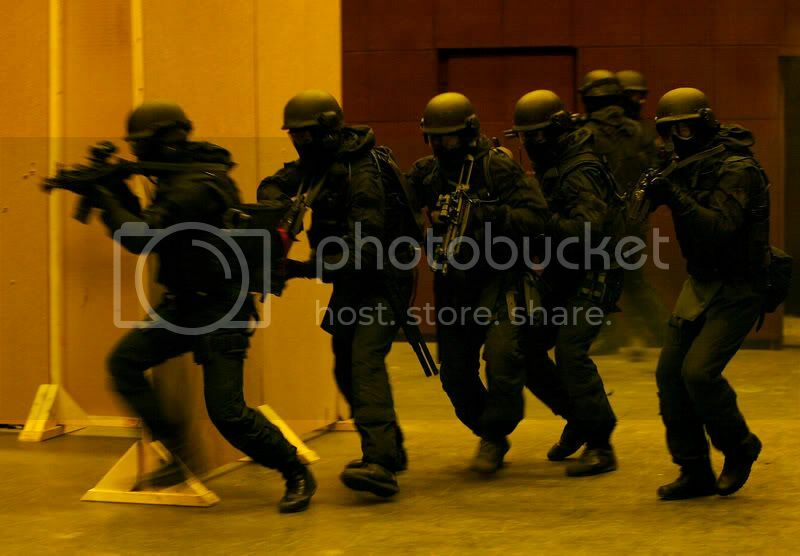 I'd have to say the 22nd Special Air Service because they have so much experience and are probably one of the first to take room clearing seriously since the Battle of Berlin in '45. The EKO Cobra. The Austrian Special Forces. To this time these are the only guys that successfully ended an aircraft hijacking while in mid air. Well if the world had a group of SF made up of the worlds best soldiers from the special forces. Backed up with every secret toy in every countries lockers and a world wide inteligence network. Plus sactioned to operate any where without waiting a month for UN approval. Then a group like the fictional Rainbow on steriods would be the #1 SF Group on earth lol. Just think. If even just the US, UK, Germany, France, and Russia joined forces like that. With total trust and cooperation (never will happen) It would indeed be a very bad day to be a terrorist. Because the second you leave yoru cave some one will smell it and step on you as hard and as fast as a Jet flies. They specialise both in military operations as well as counter-terrorism in the homeland. They're the mother of CQB. They have a lot of tradition and experience because they're so old. Well DUKE i have heard of them lol but i thought that GSG9 would have been a better choice. There are two in Germany, the KSK and the GSG9. I believe the difference is in their tasks. The difference is: The GSG9 doesn't operate in war zones. Sure,- but the KSK was established 1996 to do this job! --> Read my links above! Hey Duke it's right that the KSK does operate in war zones, but they are also a great special Unit, because they have the same tactics. But there are also the SEK (Sondereinsatzkommando) in each state. The GSG9 is just called if the SEK teams say they have no the equip for this situation. I have a big map with all special untis in the world, and i must say that the most units comes from America. but a lot of Units also comes from Israel. P.S. : Duke i hope i see you again any time.!? Looking at the poll results and the leaders, 22nd SAS and FSK. I guess you can say we are a bit partial lol. Well people im loving all of the posts that you have entered in this poll that was taken on by myself. Interesting how this has brought out the little soldier in all of us lol.....It is true that there is no best special forces group. Different Countries have different standards when using special forces most use them in the classic role of special operations and assisting regulars in operations. While some are used in a civil capacity like how the SAS was used in Northern Ireland. Which is the beauty of UKSF. But that is just my opinion. Each Unit mentioned in this poll is the best soldiers of their nation and a great tribute to all soldiers and armed forces personel in all Hot zones around the world.